The Green Horticultural Group are suppliers of the Field Top Maker, a shallow operating cultivator with an adjustable operating depth of +50mm to -50cm. 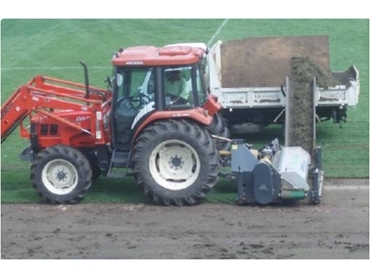 Field Top Maker shallow operating cultivators are suitable for a variety of uses and any turf surface, culminating in a smooth and level finish. smooths elevations in goal areas. This Field Top Maker shallow operating cultivator offers true reduction of thatch compared with scarifying. It's capability of eradicating weeds, such as winter grass and Parramatta grass, mechanically instead of chemically, are a reality. The major advantage of this shallow operating cultivation system is that the soil hydrology, soil life and stability are not disturbed. The Field Top Maker is available for hire as a single operation, or can be a strip and remove package.